Cambodia is a war stricken country, devastated by wars, civil wars, Khmer rogue, corruption and political instability. Over recent years the situation is slowly beginning to improve. However, Cambodia is still rated as one of the poorest countries in the world (by the UN), and millions of people live in extreme poverty. During the Khmer rogue period, as many as 25% of the population was executed, and as most people executed were those educated, the country was left with a huge knowledge gap that will take many generations to recover. More than 50% of Cambodia's population are 18 years or younger, and educating them is essential to Cambodia's future. 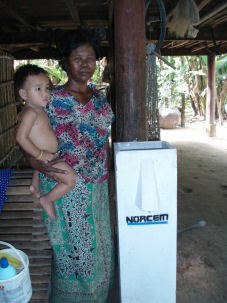 Through funding from sponsoring corporations, local charity work, collaboration with Trailblazers Foundation (US Charity) and but not least volunteer workers, NEDO can provide free access to clean drinking water to villages in rural areas of Siem Reap. Community training, and basic hygiene and healthcare education plays an important part of the project. The Water Filter Project was initiated in 2006 and now (April 2013) serves more than 8.500 children and adults. Love Cards is a local charity and non profit business started up by NEDO. 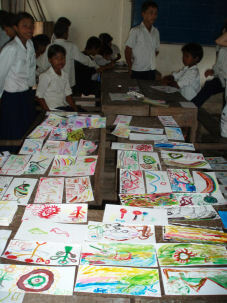 Love Cards provide free art classes for schools in the Siem Reap Province. As part of the art program, children and youth at the schools paint postcards that Love Cards sell through a growing distribution network within the tourism industry in Cambodia. Cards are sold on a voluntarily basis without sales commission. Profit from cards sold is used to provide funding for educational and recreational projects at the same schools. The White Bicycles is an educational initiative aiming to promote and educate local organisations to favour sustainable ways to conduct fundraising with goals to develop their organisations. The White Bicycles is a local charity and non profit business started up by NEDO. 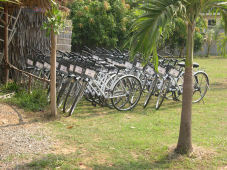 The White Bicycles Provide a bicycle rental service for hotels and tourists in Siem Reap, Cambodia. Proceeds from the rental service goes directly to provide job training and micro funding to aid projects in the rural area of Siem Reap. The project now also fund part of NEDO's Student Sponsorship Program. NEDO initiated a student sponsorship programme in 2006. The program aims to help underprivileged children and youth to remain in school until finished high school and to offer higher educational opportunities at university level. As of 2013 most sponsored students are at university level, and some have even graduated with bachelor and master degrees.